Okay, Wow! It's been a busy month! We took two weeks to go back to Ohio, where we picked up a van that our folks gave us and then drove it back across the Trans Canadian highway, stopping to camp for five days in Banff..The country we traveled through was spectacular and I can't wait to get started on some larger canvases from the pics and sketches that I made there! Next week we take off again for camp High Rock, a summer camp for kids off the Yakima reservation in eastern Washington . This will be our fifth year serving as camp counselors along with folks from our church, Liberty Bay Pres., Harrah community church and Sacred Road ministry. 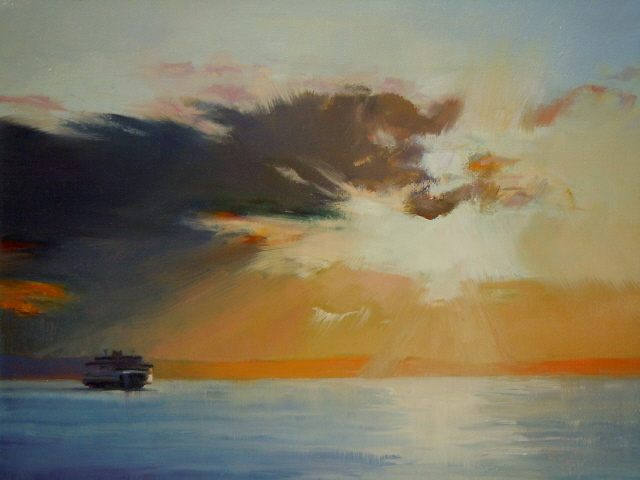 Finally, please come to my solo show, opening this Friday, 7/1/2011 at the Directors Gallery on Bainbridge Island . 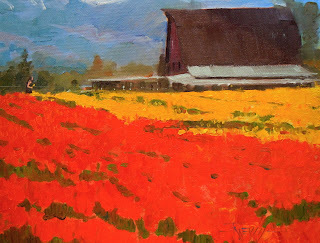 I will be there from 6:00pm till 8:00pm and would love to say hi if you are in the area.Winslow Way is still pretty torn up from road construction but there is a really nice outside sitting area right by the gallery and the weather is looking good!! Yea! 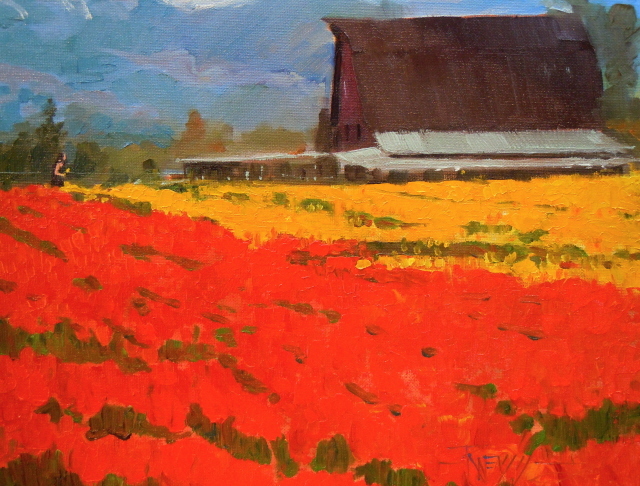 See ya there and thanks for supporting In Plein Air!! It is getting close to "Show Time" folks!!! If you would like to see this work up close and personal.....and maybe even take it home to hang over your fire place...come on over to the Directors Gallery on Bainbridge Island the first week of July.....I will be at the gallery for the first Friday art walk and would love to meet you! 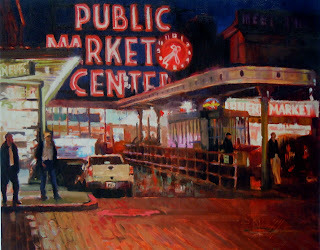 The gallery will be full of my recent original paintings of Seattle and the surrounding regions of the Pacific Northwest. 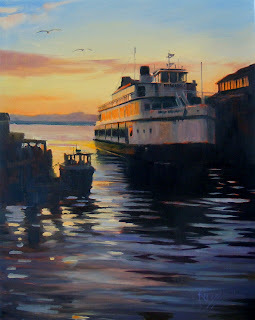 Not too many ferry paintings make it to my easel....but I just had to try and capture this dramatic sunset over Elliot bay.....the ferry gave it that sense of interest and location. This painting was inspired by the view outside my window at the Knowles Studio. I had been watching the apple trees blossoming and wishing to paint them but every time I got the chance, it would cloud up and rain...or hail...or snow...or drizzle..or blow a gale....Sheesh! What a spring we have had!...Any how, I finally turned my easel around and painted the garden chairs under the apple tree... that no longer had blossoms...... but I remembered them...I painted these same garden chairs last year, en plein air......when we had much nicer spring weather..